We were reading up on our magic the other day and wanted to know: what is the difference between a witch and a sorceress, anyway? Well, some say the difference is the use of powerful, dark magic. But we say...the difference is clear; a sorceress gets to wear a truly superior costume. Any lady can dress herself in black and top the look with a pointy hat and call herself a witch. But this sultry Sorceress Costume is a step above and beyond, just like the magic of its wearer. 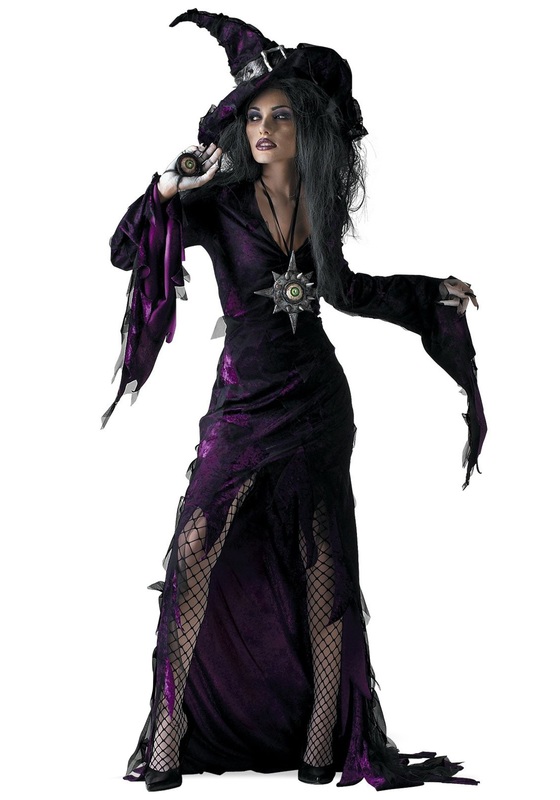 So if you’re looking for a way to stand out at that big Halloween bash (or if you really are a sorceress by trade) this ensemble will cast a spell on partygoers and townsfolk alike. This spooky look features a stylized dress with long bell sleeves, a plunging V-neck, and an alluring off-center front slit. The hat has that shabby-chic, “I have been doing spells in this hat longer than you’ve been alive” look, and the costume even comes with a medallion necklace and an eyeball prop to help you get your black magic mojo. We would include a few starter hexes, but you seem to already know them all. Whatever subtle elements make you the sorceress you are, we’re happy to provide you with this look that (hopefully) gets us on your good side. ‘Cause you look fierce! I received this awesome costume a few days after purchase. I'm very impressed by the quality of materials and workmanship. It fit like a glove!!! I also ordered shoes which also fit perfect. I would definitely buy again from this distributor!!! Thank you. I just got this costume and it is GREAT! I had to order the Large because that's all they had and figured I'd adjust it to me S/M frame (5'4", 125lbs) but it fit perfect. It is a very high slit and a somewhat low neckline but I liked both. It was long on me, even with 4" platform shoes. It will be easy to trim the edges of the end because they are jagged anyway. The hat and accessories were a bit crippled from the shipping but nothing a little finagling didn't fix. I bought a large but it fits like xtra small. The hat is made poorly and is very tiny. This costume is perfect for my wife. she love it.